To Smite the Demon Horde! 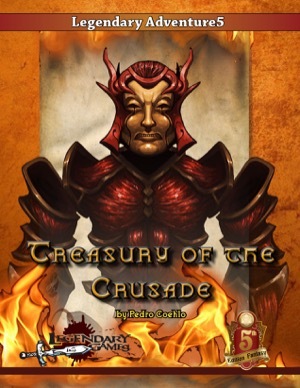 Treasury of the Crusade brings you dozens of new 5th Edition magical items fit for a crusade, where the valorous guardians of the mortal realms stand in defiant resistance against the encroaching armies of the demon lords. They range in power from simple trinkets and tokens and magical signaling devices to mighty weapons and powerful artifacts. Some are emblematic of glorious goodness, while others reek of ineffable evil and demoniac damnation, but each one can serve to make your campaign more exciting and your treasure hoards more interesting. They add delightful detail and innovative options for heroes and villains alike, whether found as captured plunder after the sack of an enemy fortress or recovered relics of a lost outpost or expedition, or even granted as a token of esteem by the crusader commanders who keep vigilant watch upon the demon-haunted borderlands. These items range from the militant to the mundane in this book, from weapons and shields to bindings, books, and music boxes. It's true that a crusader's heart is not quite so deeply invested in treasure as a mercenary's or explorer's, but if it's a rich assortment of gear for good and bad alike they seek, they are going to love what they find in the Treasury of the Crusade. Grab this 16-page magic item supplement today to enrich your 5E campaign and Make Your Game Legendary!